Speaking to media persons outside 7 Race Course Road, Mehbooba said: “The meeting with Prime Minister Modi was very positive. I will call a legislature party meeting on Thursday,” she said. 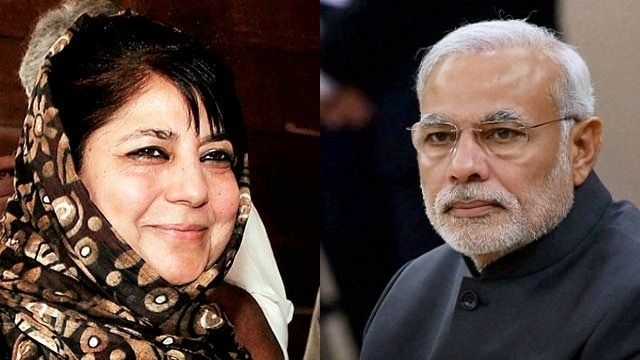 New Delhi: Amid political uncertainty in Jammu and Kashmir, PDP chief Mehbooba Mufti meets PM Modi in New Delhi today and describes her meeting with PM Narendra Modi as ‘good and very positive’. According to the sources, PDP leaders will hold an internal meeting of the party to discuss the government formation in the J&K. PDP spokesperson Naeem Akhtar told today that party chief Mehbooba Mufti will take the final call on the basis of the agenda of the PDP-BJP alliance. Akhtar claims that the PDP wants to continue on the vision of late Late Mufti Mohammad Sayeed, but wants to form a government only after faith on a few points from the Centre. The points include talks with Pakistan, special employment package for the J&K, and transfer of central controlled projects to the state, amongst others. The alliance with BJP is highly valuable to the formation of the next government in the state. The chief minister’s post in J&K is remained vacant after the sudden death of Mufti Mohammad Sayeed on January 7, 2016. Sayeed was succeeding a coalition government with BJP since March 1 last year after the Assembly elections threw up a fractured mandate. Mehbooba was seen as the successor to her father, but she has maintained suspense over the issue as till now there is no any news of such decision from her. “With the stalemate (in J&K) continuing over 2-3 months, I felt positive after meeting with Prime Minister Modi,” she said. With the BJP not ready to meet her conditions until the PDP returns the alliance to power according to the sources. National Congress leader Omar Abdullah, who met Governor NN Vohra in Jammu on Monday, told media that his party was not in favour of fresh polls in the state but the party will prefer it over horse-trading.